Vice President of Operations at Petroleum Geo-Services ASA, Paul Courtney (left), praises the simulator park at USN, here next to technical operator Svend Nordby. USN offers a new course that simulates all the operations of a crew aboard a seismic vessel. Participants train on real world, critical situations in a world-class simulator park. The advanced simulator course for multiple professional groups in the oil industry is provided by the Institute for Maritime Operations at the University of South-East Norway (USN), in cooperation with Petroleum Geo-Services ASA (PGS). 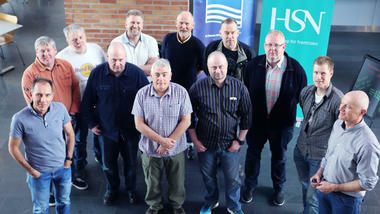 PGS sends key personnel from offshore vessels on full-scale simulator training at the college campus at Bakkenteigen in Vestfold. Here at the simulation and interaction laboratory (SimSam), participants get hands-on training and experience on realistic simulators. “Engineers and navigators have already begun to complete mandatory courses in the simulator lab. The unique thing about the new course is that the seismic crew is also part of the training so that the entire operational crew are training together,” says project manager Nikolai Smit. Seismic is about investigations made to reveal geological formations below sea and is essential for oil and gas exploration. "When the entire crew is training on critical events that may occur during maritime seismic operations, it can improve corporate culture. The better they work together, the better the results can be. This can contribute to less damage to equipment and fewer accidents,” says Smit. Vice President for Operations at PGS, Paul Courtenay, say they are keen to create one common culture on board. He praises the simulation course the company has put in place in cooperation with USN. "We plan to send crew on this course with the goal of getting ‘one culture’ onboard the ships. At USN they get trained in safe surroundings on realistic events that we hope never will happen, but which we still need to be prepared for. It is important for the company that the entire crew work together as an effective project team towards the same goal. We are committed to preventing accidents on employees and equipment”, said Courtenay. At the college's state-of-the-art simulator center at the Research Park at Bakkenteigen, participants are challenged in critical situations they can meet in real life. In the past, maritime and scientific crew were working on board the ship separately. Here the crew is training in solving unexpected events as a team. The training takes place in a controlled environment in real-life scenarios. “Seismic vessels and equipment cost billions and are operational most of the time. The challenge is to be prepared to handle critical events that may arise. Simulator training in safe surroundings is a great way to train for unforeseen events and in stressful situations. The purpose of simulator training is to give participants the feeling of control of the situation”, explains Smit. “First we run a theoretical part, followed by simulator training with different scenarios with debriefing after each scenario where we talk about what was good and what could be done better. The whole course is about creating ‘one culture’ on board the vessels, in order to establish a good cross-departmental security culture on board", Smit continues. USN is one of the country's largest educational institutions with 18,000 students preparing for tomorrow's working life. The world-class simulator park is used both in-house and in collaboration with outside companies. The University College has an agreement with Kongsberg Digital on delivery and installation of state-of-the-art technology and further upgrades to shipbroker simulators. "It is important for USN to work closely with the business community to make sure we stay relevant. We want businesses to come to us and see that exchanges of expertise and cooperation between business and students is fruitful”, says Smit. The new simulator course, in collaboration with PGS, is based on international standards and requirements for safety courses, and also goes beyond national and international requirements. “The course is for multi-level leaders. Participants come as a team at the simulator course when they are on their way to work”, explains Smit. The course focuses on leadership, communication and interaction in teams during critical events, which should not happen offshore, but which the crew must be prepared for to respond effectively and correctly when it happens. At the USN high-tech simulator park, the entire crew from the vessel receives training on realistic situations. "PGS has a goal of avoiding personal injuries and property damage as part of our health, safety and environmental work. Seismic at sea is complicated and we have a number of preventive measures to achieve our ambition. Simulator training at USN is one of them”, says Communications Manager Bård Stenberg in PGS. This investment is independent of market trends. He points out that the market is still characterized by overcapacity and intense competition, but still believes that a higher and more stable oil price forms the foundation for better fundamental market conditions in the future. “In addition, the oil companies must at one point address the falling reserve replacement rate. When exploration activity increases, demand for seismic will also increase”, says Stenberg. 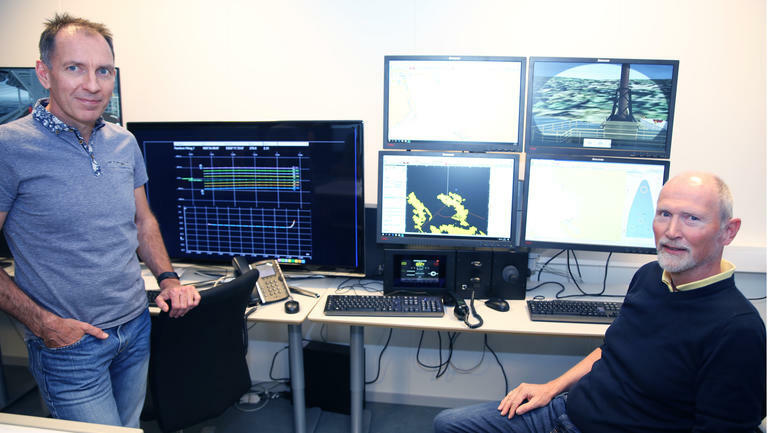 On the simulator course for maritime seismic operations at USN, technical operator Svend Nordby in the control center can simulate all possible scenarios. Here PGS has built their own specific simulators for their courses. "The simulators give the feeling of being on real seismic vessels and there is full action here during training. In the aft deck simulator, the participants practice positioning to see the angles of the streams, which in reality can be several kilometers long. The cables contain a lot of expensive equipment, and it is important to prevent them from collapsing. There are three different stations so that the crew can collaborate on the tasks”, explains Nordby. The rear tire simulator that Kongsberg Digital has developed for PGS is unique. USN welcomes more companies to the simulation center for customized training. “We tailor-make the courses using a simulator in cooperation with the customer. We can offer courses and opportunities for development and testing not only for offshore, but also in preparedness and social security, rescue services, emergency services and others, such as port agencies and insurance companies. There are also opportunities to recreate events to find and understand background and relationships. Just contact us!”, says Smit.